What is the IFERROR Function? In financial analysisFinancial Analyst Job DescriptionSee a real Financial Analyst Job Description including all the skills, experience, and education required to be the successful candidate for the job. Perform financial forecasting, reporting, and operational metrics tracking, analyze financial data, create financial models, we need to deal with formulas and data. Often, we will get errors in cells with a formula. IFERROR is often used for error handling/capture. It handles errors such as #N/A, #VALUE!, #REF!, #DIV/0!, #NUM! #NAME? or #NULL!. Value (required argument) – It is the expression or value that needs to be tested. It is generally provided as a cell address. Value_if_error (required argument) – The value that will be returned if the formula evaluates to an error. 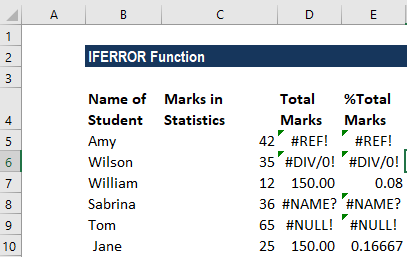 As a worksheet function, IFERROR can be entered as part of a formula in a cell of a worksheet. 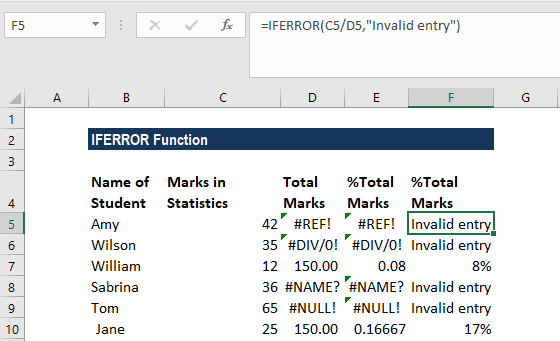 A very common use of IFERROR function is with VLOOKUP function, where it is used to point out values that can’t be found. Instead of the #N/A error message, we can input a customized message. It will look better when we are using a long list. Suppose we are given monthly sales data for the first quarter. We create three worksheets – Jan, Feb, March. The IFERROR Function was introduced in Excel 2007 and is available in all subsequent Excel versions. If the value argument is a blank cell, it is treated as an empty string (”’) and not an error. If value is an array formula, IFERROR returns an array of results for each cell in the range specified in value.